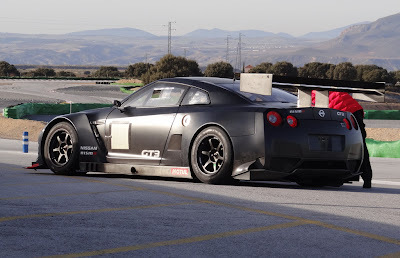 Unlike the all wheel drive road car, this car is rear wheel drive, inline with GT3 regulations. The above photo shows the 2009-2011 CBA front bumper, but the GT3 car for the 24 Hours of Dubai this weekend, sports a 2012 or DBA front bumper/grill. Is there a chance we will see one in a US series? 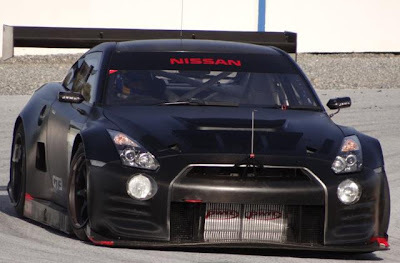 NISMO and JR Motorsports (JRM), its official partner for this major project, have been jointly developing the car during 2011 and, following a series of extensive tests - which have included three competitive outings - the car's performance and durability has proven its credentials for GT3 racing worldwide. Designed with customers in mind, driveability has been an important factor in the new car's development programme. Therefore, as well as featuring a chassis that inspires confidence, suspension set-up and driver controls can easily be adjusted to suit a range of preferences. The car is to be displayed in the UK at Autosport International (Europe's biggest motorsport exhibition) on Thursday 12th January, where it will be unveiled on the JRM exhibition stand. It will then be displayed for the remaining three day's of the show. The car will appear alongside the GT1 Nissan GT-R that won the 2011 FIA GT1 World Championship. 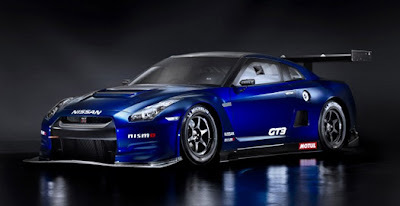 To celebrate the launch, JRM will simultaneously run the Nissan GT-R NISMO GT3 as an official Nissan Europe entry in the Dubai 24-hour race, where it will be driven by four Nissan Champions from 2011: Michael Krumm, Alex Buncombe, Tom Kimber-Smith and Franck Malliaux.